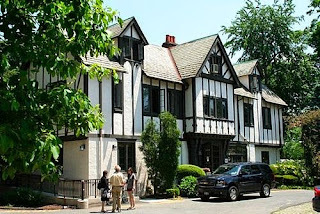 Princeton Terrace Club is one of the eleven current eating clubs at Princeton University in Princeton, New Jersey, United States. Terrace Club was founded in 1904 as the twelfth club at Princeton. It is located at 62 Washington Road, making it the only one of Princeton's current eating clubs that is not situated along Prospect Avenue. In 1967, Terrace became the first eating club to switch a nonselective lottery "sign-in" system to determine membership, as opposed to the selective bicker system. It was soon followed by Campus, Colonial, and Cloister, and today 5 of the 11 remaining operating clubs do not use the bicker system. Terrace was one of the first of the clubs to accept Jewish, African-American, and female members, and today is considered on campus to be the most "alternative," politically liberal eating club. Often, members are stereotyped according to this reputation, but the actual membership is very diverse in terms of background, sense of style, and academic interests. Since 2000, Terrace has been a popular choice for sophomores, filling all of its membership slots either during first round sign-in or by the end of the second round. Terrace's motto has been "Food=Love" since the mid-eighties. The food is served cafeteria-style and is famous for being more "vegetarian friendly" than other clubs. Members of Terrace often refer to the club as "Terrace F. Club" or "TFC". Other nicknames include "the mother," "mother Terrace," or "the womb," and members often refer to themselves as "Terrans". Weekend events at Terrace often include concerts of indie-scene bands from a variety of genres, including rock, hip-hop, salsa, jazz, and electronica. Many notable artists and groups, including Stanley Jordan, Flipper (band), Phil Lesh, Yo La Tengo, GWAR, Blues Traveler (Summer '87), ESG (band), Bim Skala Bim, Elliott Smith, Run DMC, Modest Mouse, The Flaming Lips, Vampire Weekend, Frightened Rabbit, Girl Talk, GZA, Immortal Technique, Stereolab, Snarky Puppy and Tortoise have played at Terrace, some before they were nationally well-known. Terrace also hosts the Queer Radicals' annual Drag Ball in October or November. As was then common practice for newly founded eating clubs, when Terrace Club began in 1904, the members dined in a building on Olden Street known as "The Incubator". This small structure had previously been the original home of Cap & Gown, and had been relocated to Olden Street from Cap's current location. It served as a temporary home for many eating clubs while their own buildings were under construction or being renovated. In 1906, the club relocated to the current Washington Road location, which was occupied by a house in the Colonial Revival style which had formerly belonged to faculty member John Grier Hibben. This building was remodeled by architect Frederick Stone in the 1920s to the current configuration with its Tudor-style exterior. A tea party at Terrace in 1936 is credited as the birthplace of the idea for the short-lived Veterans of Future Wars, an organization that satirized the acceleration of bonus payments to World War I veterans by demanding that its young members be similarly paid for the services they would render their country in conflicts to come. In 1967, Terrace became the first club to abandon the Bicker process. Terrace Club and Colonial Club were the first clubs to accept women following the University's decision to admit women in 1969. In 2011, Terrace became the first club to offer membership to graduate students. From 1977 until 1984, many of the sign-in clubs faltered amid low membership numbers, and the graduate board seriously considered closing Terrace in 1983. As an attempt to attract new members Chef Larry Frazer began cooking vegetarian meals, an entirely new concept on campus at that time. Frazer was married in Terrace Club in 1982 with the officers acting as attendants and guitarist extaordinaire Stanley Jordan as the musical performer. Frazer later moved on to become chef at Campus Club at the short-lived DEC and as the Executive Catering Chef for the University itself. Continuing his long relationship with the eating clubs, he later remarried in 2005 at Cap and Gown. Much of the reputation Terrace enjoys today grew out the leadership and love of the late Barton R. Rouse, the creative force behind Terrace's parties and excellent food. Frazer had hired Rouse originally to serve as sous chef in 1984 and he later succeeded him as head chef for the club. Barton was the originator of the club's Food=Love motto and brought an imaginative flair to his job, including the creation of themed meals and parties which soon became a hallmark of the club. Rouse served in this role until his death in 1994. Many Terrace members rise to the club's challenge calling them to insert the phrase "FOOD=LOVE" into their Senior thesis projects. Terrace members traditionally complete an "offering" upon joining the club as sophomores. The "offerings" often involve enacting minor acts of humorous mayhem around campus. William H. Scheide '36 - Musician, philanthropist, and humanitarian. Relocated the Scheide Library, "probably the finest private library in existence in the world," to Princeton's Firestone Library. A primary funder of Brown vs. Board of Education. Todd Wider '86 - Todd Wider is an American plastic surgeon and Emmy Award winning film producer based in New York, who is active in documentary filmmaking. E. Randol Schoenberg '88 - a U.S. attorney, based in Los Angeles, California. Successful case in Supreme Court of the United States Republic of Austria v. Altmann in 2004. President of the Los Angeles Museum of the Holocaust. ^ "Timeline of the Eating Clubs at Princeton University"
^ "Terrace votes to accept graduate students"
^ Amy Westfeldt, "The New York Times, The Wall Street Journal Win Pulitzers," Associated Press State and Local Wire, 7 April 2003.